Richie Ryan took maximum points this weekend in the Irish Masters Superbike championship as he took the treble. The Kilkenny native dominated each of the 3 races and finished ahead of 2016 “Young Rider of the Year” Robert English who took the three 2nd places. The three 3rd positions went to Gerard Kinghan, Luke Johnston and Peter Moloney. This places Richie Ryan firmly at the top of the Pro championship table. In the Superbike Cup races, the podium looked the same for the 3 races. Andrew Murphy extended his gap at the top winning all three from Michael Gillan who took the three 2nd positions on offer. Raymond O’Neill left the weekend in 4th place in the championship with his 3rd places. Dean O’Grady remains in 3rd place in the title fight. The Supersport races this weekend provided unhealthy entertainment again as these tarmac terrorists ripped the track apart as if their lives depended on it. It was truly a spectacle to watch and the championship table does not do justice to how the races unfurled. 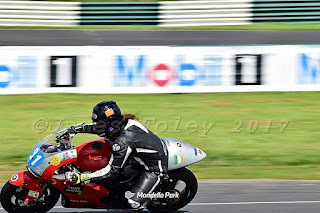 Jason Lynn was the benefactor of winning 2 as Korie McGreevy won his first ever Pro Supersport race in Mondello taking the 3rd win. It could have been a completely different story were it not for a slip off in Race 2. Ross Patterson benefited from 2 2nd places and a third but, Eunan McGlinchy made a headline by becoming the first ever 600 Cup rider to stand on a Pro podium in Race 2. Aaron Clifford returned to the podium taking 3rd position in the first race. 3 surprising results in the Pre-injection races this weekend was as a result of Alan Kenny showing up. Alan laid down a marker from the outset and took Saturday’s race win while putting in a 58 second lap. Joe Grant and Johnny Irwin were 2nd and 3rd in Race 1. In Race 2, brothers Michael and Ian Prendergast decided it was going to be them on the podium and Michael deftly decided that he’d grace the 2nd spot and leave 3rd for Ian. In race 3, Joe Grant and Darryl Sharkey replaced both brothers by taking 2nd and 3rd to improve their points tally in the championship. Production twins were dominated again by Eunan McGlinchey winning all three races. Jason Cash followed him home in 2nd for the three races also. The remaining 3rd places went to Gary McCoy, Alan Rigney and Shane Sweeney. Eunan has a comfortable lead at the top of the table with Jason Cash in 2nd and Alan Rigney in 3rd on 120 points. Dave Butler and Derek Wilson shared the top step over the weekend with Dave taking 2 and Derek spoiling his treble in the last race on Sunday. Derek also took the 2nd places when not winning. Simon Reid kept his grip on 3rd place in the Championship as he claimed two 2nd places as Liam Chawke also grabbed a 3rd in Race 3. 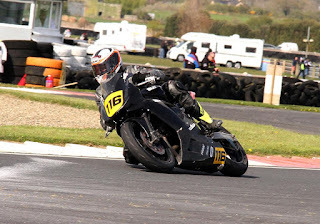 Brendan Glover also had a treble this weekend in the Junior Cup class taking Race 1, 2 and 3. In the first 2 races he had to fend off the efforts of Cameron Dawson who had to settle for two 3rd positions and unfortunately took a tumble. Jamie Lyons and Nathan McGauran were quite happy with their positions as Jamie took 3rd in Race 1 and Nathan 3rd in both Sunday races. Tom Greenwood completed the podium in Race 3 for 2nd position. Brendan leads the championship currently. 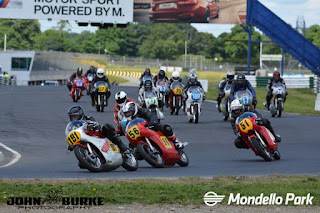 The Dunlop Young Guns championship saw runaway victories in each race for Jonny Campbell also as he saw off the competition from Edward Keogh who had to settle for 2nd place three times. Not a bad complaint. 3rd place went to Ryan Desmond in Races 1 and 3 with Oisin Maher taking the last spot on the podium in Race 2. This championship could get very interesting now that Campbell has added 75 points to his tally. 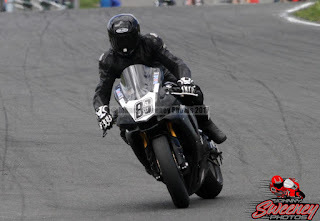 Jason Cassells did his title hopes no harm by taking 2 wins and a 3rd over the weekend. He was thwarted by rival Mark Camblin though, who raced hard over the 2 days to come away with a 1st, 2nd and a 3rd place on the National track. Alvin Griffin wasn’t letting up either and he was rewarded with a 2nd and 3rd place trophy to bring home. Dean Campbell and Jason Cassells were 2nd and 3rd respectively in Race 2. 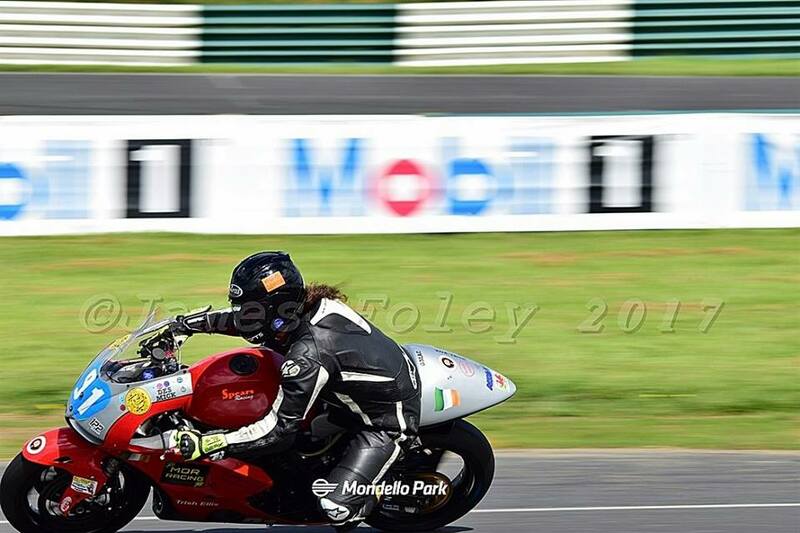 Cork racer Nicola Farrissey was present all weekend and worked hard to reduce her lap times and that she did. Padraig Graham was the best performed in this class with his 2 wins and a 2nd. Jonny Campbell began the meeting with a 3rd and gradually worked his way up to 2nd in Race 2 and then went a step further taking the win in Race 3. Kyle Martin picked up a 2nd and 3rd place in Race 1 and 2, while Kyle Nolan collected 3rd in Race 3. In the Superbike “B” race on the Saturday, Alan Armstrong took the win from Robert Toner in 2nd and Anthony Derrane 3rd on the ZX10r. The Supersport result went the way of Stephen O’Connor from Shane Graham in 2nd and Stephen Montgomery in 3rd all on Yamaha R6’s. 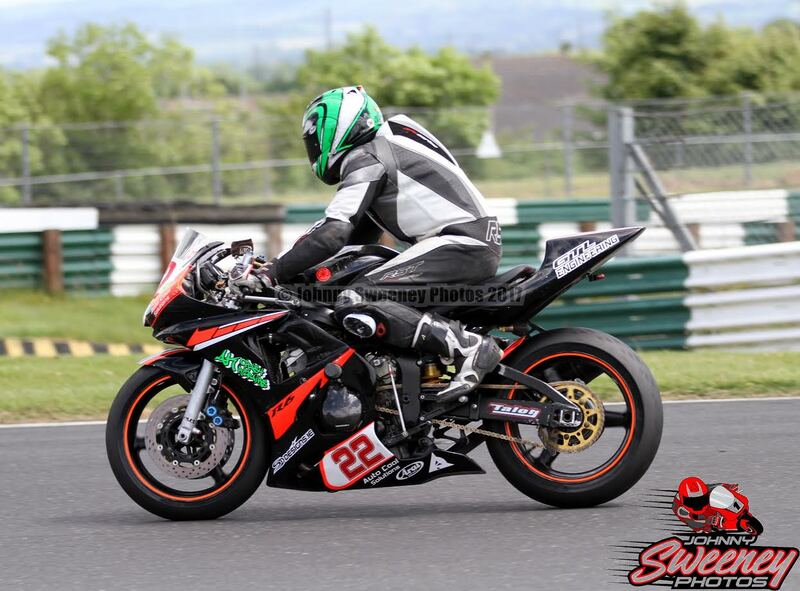 Both Sundays Superbike races were won by veteran John Cahill. Race 2 saw John Griffin take 2nd from Kevin Maher, a result that Kevin reversed though in Race 3. 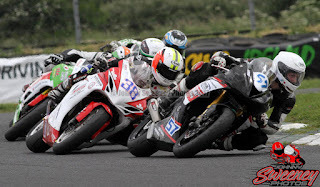 Sundays Supersport races were won by Stephen Montgomery who was followed home by Ryan Maher. The two 3rd places went to Chris O’Mahony and Maurice Keogh. In qualifying, almost every “B” race competitor was either lapping in 1 minute or less, showing how competitive the “B” races are. What the F1 class is lacking is quantity, but it surely makes up for this in quality. I haven’t perused all the bikes but, Chris Campbells ZX7r is a wolf in wolfs clothing. Still has to be ridden though, and Chris excelled in this winning all three races. David Murran and Davin Casey completed the podiums with David taking 2nd place in Race 1 and 3, while Davin upstaged him for 2nd in Race 2. I’m unashamedly a Ducati snob, so the sound of Brian Murphy’s 888 on the grid is music to my ears. Hearing it three times over the weekend is a bonus. Brian put the SP4 on pole and then carried on to win all three races but, had to work hard to keep CSBK regular Robin Heathcoate off the top spot at all times. Brian leads the championship from Robin, with Sean Griffin sitting in 3rd powered by his fine looking YZF750 Yamaha. Such is the level of entrants in the amalgamated Masters and National series, it’s a regular event to see a “C” race being hosted. In the Supersport category, Haydn Walsh didn’t hang about and won the 3 races on the R6. Race 1 and 2 had identical podiums with Colm Gough 2nd twice and Thomas Bermingham taking 3rd. In Race 3 John Shields was 2nd and Colm Gough 3rd. In the C F1 races, Adam Boyle won the 1st race and Stephen MeGill won the remaining two with Adam taking a 2nd place in Race 2. 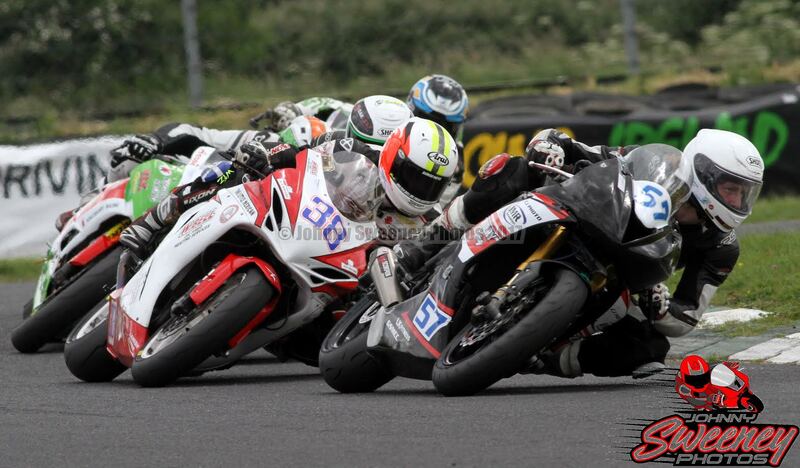 In the Classic Superbike C race it, was mainly between Cork’s Sean Griffin and Patrick Brennan. 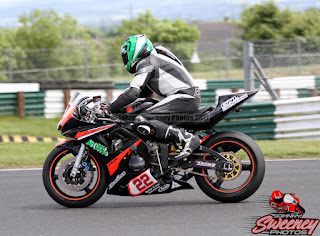 In Race 1, Patrick took the win from Dunshaughlin’s Philip Benson on the GSXR750 with Sean Griffin 3rd. In Race 2, Benson DNF’d promoting Griffin into 2nd. This podium boosted Sean, who upped the ante to win Race 3 from Patrick Brennan. The “slidechairs” had an extra race last weekend on account of missing one at Rounds 4, 5 and 6 and they didn’t disappoint when called upon. Dylan Lynch and Dave Butler have had an excellent start to the season and took maximum points winning all four races. However, Fergus Woodlock and a combination of passengers including Diarmuid Cunningham and Alvin Griffin produced a fine string of results that ended with three 2nd places and a 3rd. Scooby Killough and Eamon Mulholland also did well with a 2nd place and two 3rd places. The remaining 3rd place went to Denis Cusack and Simon Mythen. Dylan leads the drivers’ championship from Scooby and Fergus’s promising weekend sees him leapfrog Terry O’Reilly into third. The passengers table is led by Dave Butler from Eamon Mulholland with TT veteran Aidan Browne in 3rd place. The Classic riders got an opportunity to shine on the Saturday and they took full advantage. Alex Conroy made most use of the day winning both races on the 500cc, while Tony Willis had a reliable 2nd place in each outing. Not to be outdone, Andy Kildea also finished well, achieving the 3rd places over the day. To put the Classic lap times into perspective, the qualifying time are about the same as a decent Production Twin and that’s not be sniffed at given their age and geometry\power output. Rounds 10, 11 and 12 are back in Mondello on July 15th and 16th. Thanks to all the officials, medics, photographers and staff and get well soon to those hurt while racing.